15 March: Mackintosh's designs for furnishing the Headmaster's rooms 'were again examined and the style of the furniture generally approved with some slight modifications'. 15 December: Formal opening of the completed School. 'The Glasgow School of Art (Three Interiors)' exhibited at Glasgow Institute of the Fine Arts (730). 'The Glasgow School of Art (West End)' exhibited at Glasgow Institute of the Fine Arts (892) under Mackintosh's name. 'The Glasgow School of Art – interiors' exhibited at Royal Scottish Academy (450). Winter: Doug Stonelake wins architectural competition for pedestrianisation of Renfrew Street opposite the School. 95 Not carried out. Completion of Mackintosh Conservation and Access Project. 103 Major funders: Heritage Lottery Fund, The Monument Trust, European Regional Development Fund, Glasgow City Council, Historic Scotland, The Hugh Fraser Foundation, The Garfield Weston Foundation, Scottish Enterprise Glasgow, The Gannochy Trust, Professor Nick Kuenssberg, The Estate of Ernest & Mary Shaw and The Robert Barr Charitable Trust. 23 May: West wing severely damaged by fire and interior of library destroyed. 15 June: Entire building severely damaged by second fire and interior destroyed. 1: Glasgow School of Art Archives: Governors' minutes, GOV 2/3. 2: Glasgow School of Art Archives: Governors' minutes, GOV 2/3. 3: Glasgow School of Art Archives: Governors' minutes, GOV 2/3. 4: Glasgow School of Art Archives: Governors' minutes, GOV 2/4. 5: Glasgow School of Art Archives: Governors' minutes, GOV 2/4. 6: Glasgow Herald, 26 February 1896, p. 10. 7: Glasgow School of Art Archives: Governors' minutes, GOV 2/4. 8: Glasgow School of Art Archives: Building Committee minutes, GOV 5/1/1. 9: Glasgow School of Art Archives: Governors' minutes, GOV 2/4. 10: Glasgow School of Art Archives: Governors' minutes, GOV 2/4. 11: Glasgow School of Art Archives: Governors' minutes, GOV 2/4. 12: Glasgow School of Art Archives: Governors' minutes, GOV 2/4. 13: Glasgow School of Art Archives: Governors' minutes, GOV 2/4. 14: Glasgow Herald, 2 February 1897, p. 7. 15: Glasgow School of Art Archives: Governors' minutes, GOV 2/4. 16: Glasgow City Archives Collection: Glasgow Dean of Guild Court, Register of Inspections, D-OPW 25/64, p. 3. 17: Glasgow School of Art Archives: Governors' minutes, GOV 2/4. 18: Glasgow School of Art Archives: Governors' minutes, GOV 2/4. 19: Glasgow City Archives Collection: Glasgow Dean of Guild Court, Register of Inspections, D-OPW 25/64, p. 3. 20: Glasgow City Archives Collection: Glasgow Dean of Guild Court, Register of Inspections, D-OPW 25/64, p. 3. 21: Glasgow City Archives Collection: Glasgow Dean of Guild Court, Register of Inspections, D-OPW 25/64, p. 3. 22: Glasgow City Archives Collection: Glasgow Dean of Guild Court, Register of Inspections, D-OPW 25/64, p. 3. 23: Glasgow City Archives Collection: Glasgow Dean of Guild Court, Register of Inspections, D-OPW 25/64, p. 3. 24: Glasgow City Archives Collection: Glasgow Dean of Guild Court, Register of Inspections, D-OPW 25/64, p. 3. 25: Glasgow City Archives Collection: Glasgow Dean of Guild Court, Register of Inspections, D-OPW 25/64, p. 3. 26: Glasgow City Archives Collection: Glasgow Dean of Guild Court, Register of Inspections, D-OPW 25/64, p. 3. 27: Glasgow City Archives Collection: Glasgow Dean of Guild Court, Register of Inspections, D-OPW 25/64, p. 3. 28: Glasgow School of Art Archives: invoice for travelling expenses, GOV 5/7/69. W. B. Sayers, consulting electrician, had already visited this new building on 17 March (Glasgow School of Art Archives: bills and receipts, GOV 5/7/107). 29: Glasgow School of Art Archives: Governors' minutes, GOV 2/4. 30: Glasgow City Archives Collection: Glasgow Dean of Guild Court, Register of Inspections, D-OPW 25/64, p. 48. 31: Glasgow School of Art Archives: Governors' minutes, GOV 2/4. 32: Glasgow City Archives Collection: Glasgow Dean of Guild Court, Register of Inspections, D-OPW 25/64, p. 48. 33: Glasgow Herald, 21 December 1899, p. 10. 34: Volker M. Welter, 'Arcades for Lucknow: Patrick Geddes, Charles Rennie Mackintosh and the Reconstruction of the City', Architectural History, 42, 1999, pp. 316–32; Strathclyde University Archives, Patrick Geddes papers, T-GED 6/6/5. 35: Glasgow School of Art Archives: Governors' minutes, GOV 2/5. 36: British Architect, 57, 28 March 1902, p. 217. 37: Scotsman, 17 January 1903, p. 11. 38: Glasgow School of Art Archives: Governors' minutes, GOV 2/5. 39: Glasgow School of Art Archives: Governors' minutes, GOV 2/5. 40: Glasgow School of Art Archives: Governors' minutes, GOV 2/5. 41: Glasgow School of Art: MC.G.100 . 42: Glasgow School of Art Archives: Finance Committee minutes, GOV 2/5, 9 November 1906. 43: Glasgow School of Art Archives: Governors' minutes, GOV 2/5. 44: Glasgow City Archives Collection: Glasgow Dean of Guild Court, Register of Inspections, D-OPW 25/64, p. 3. 45: The Hunterian, University of Glasgow: Honeyman, Keppie & Mackintosh job book, GLAHA 53062, p. 46. 46: Glasgow School of Art Archives: Governors' minutes, GOV 2/5. 47: Glasgow School of Art Archives: Governors' minutes, GOV 2/5, 29 January 1907. 48: The Hunterian, University of Glasgow: Honeyman, Keppie & Mackintosh job book, GLAHA 53062, p. 46. 49: Glasgow School of Art Archives: Governors' minutes, GOV 2/5, 25 February 1907. 50: Glasgow Herald, 5 March 1907, p. 6. 51: Glasgow School of Art Archives: Governors' minutes, GOV 2/5. 52: Glasgow School of Art Archives: Governors' minutes, GOV 2/5. 53: Glasgow City Archives Collection: Glasgow Dean of Guild Court, Register of Inspections, D-OPW 25/64, p. 131. 54: Glasgow City Archives Collection: Glasgow Dean of Guild Court, Register of Inspections, D-OPW 25/64, p. 131. 55: Glasgow City Archives Collection: Glasgow Dean of Guild Court, Register of Inspections, D-OPW 25/64, p. 131. 56: Glasgow School of Art Archives: Building Committee minutes, GOV 5/1/3. 57: Glasgow City Archives Collection: Glasgow Dean of Guild Court, Register of Inspections, D-OPW 25/64, p. 131. 58: Glasgow City Archives Collection: Glasgow Dean of Guild Court, Register of Inspections, D-OPW 25/64, p. 131. 59: Glasgow City Archives Collection: Glasgow Dean of Guild Court, Register of Inspections, D-OPW 25/64, p. 131. 60: Glasgow City Archives Collection: Glasgow Dean of Guild Court, Register of Inspections, D-OPW 25/64, p. 131. 61: Glasgow City Archives Collection: Glasgow Dean of Guild Court, Register of Inspections, D-OPW 25/64, p. 131. 62: Glasgow School of Art Archives: Building Committee minutes, GOV 5/1/3. 63: Glasgow City Archives Collection: Glasgow Dean of Guild Court, Register of Inspections, D-OPW 25/64, p. 131. 64: Glasgow City Archives Collection: Glasgow Dean of Guild Court, Register of Inspections, D-OPW 25/64, p. 131. 65: Glasgow School of Art Archives: Building Committee minutes, GOV 5/1/4. 66: Glasgow City Archives Collection: Glasgow Dean of Guild Court, Register of Inspections, D-OPW 25/64, p. 131. 67: Glasgow School of Art Archives: Building Committee minutes, GOV 5/1/4. 68: Glasgow School of Art Archives: Governors' Minutes, GOV 2/7, Subcommittee on Books, Casts and Materials, 29 September 1909. 69: Glasgow City Archives Collection: Glasgow Dean of Guild Court, Register of Inspections, D-OPW 25/64, p. 131. 70: Glasgow School of Art Archives: Governors' minutes, GOV 2/7. 71: Glasgow School of Art Archives: Governors' minutes, GOV 2/7. 72: Glasgow School of Art Archives: Governors' minutes, GOV 2/9. 73: Glasgow School of Art Archives: Governors' minutes, GOV 2/10, 26 November 1915. 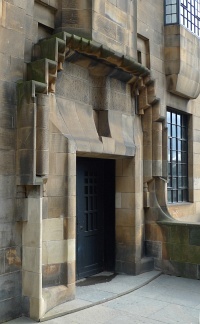 Mackintosh had been a Governor since 1909, as the representative of the Glasgow Institute of Architects. In this capacity he served on the School and Staff committee and the Library and Materials committee. 74: Glasgow School of Art Archives: Governors' minutes, GOV 2/10. 75: Glasgow City Archives Collection: Glasgow Dean of Guild plans, 1915/201. 76: Glasgow School of Art Archives: Governors' minutes, GOV 2/10. 77: Geoffrey M. Wimpenny, 'Renovation and Restoration of the Glasgow School of Art', Charles Rennie Mackintosh Society Newsletter, 13, Autumn 1976. 78: George Cairns, 'The Glasgow School of Art: The missing link of environmental systems history', Charles Rennie Mackintosh Society Newsletter, 66, Winter/Spring 1995, pp. 5–10. 79: Glasgow School of Art Archives: Governors' minutes, GOV 2/12. 80: Glasgow School of Art Archives: Governors' minutes, GOV 2/12. 81: Scottish Daily Express, 30 September 1936. 82: The Hunterian, University of Glasgow: programme for official opening of the Mackintosh Room at Glasgow School of Art, GLAHA 52418; Thomas Howarth, Charles Rennie Mackintosh and the Modern Movement, London: Routledge & Kegan Paul, 2nd edn, 1977, p. 294. 83: Geoffrey M. Wimpenny, 'Renovation and Restoration of the Glasgow School of Art', Charles Rennie Mackintosh Society Newsletter, 13, Autumn 1976; Alison Harris, A Report on the Present and Future Condition of the Remaining Buildings of Charles Rennie Mackintosh, Dip. Arch. dissertation, Glasgow School of Art, 1976. 84: Glasgow School of Art Annual Report 1972–3, p. 17. 85: Geoffrey M. Wimpenny, 'Renovation and Restoration of the Glasgow School of Art', Charles Rennie Mackintosh Society Newsletter, 13, Autumn 1976. 86: Alison Harris, A Report on the Present and Future Condition of the Remaining Buildings of Charles Rennie Mackintosh, Dip.Arch. dissertation, Glasgow School of Art, 1976. 87: Glasgow School of Art Annual Report 1977–8, p. 14. 88: Colin B. Kirkwood, 'Notes on Mackintosh buildings', Charles Rennie Mackintosh Society Newsletter, 23, Autumn 1979. 89: Glasgow School of Art Annual Report 1980–81, p. 18. 90: Glasgow School of Art Annual Report 1981–82, p. 15. 91: Charles Rennie Mackintosh Society Newsletter, 35, Autumn 1983. 92: Glasgow School of Art Annual Report 1982–83, p. 14. 93: Jocelyn Grigg, 'The Glasgow School of Art', Charles Rennie Mackintosh Society Newsletter, 37, May 1984. 94: Tony Jones, 'Glasgow School of Art white doors', Charles Rennie Mackintosh Society Newsletter, 39, Winter 1985–5. 95: Charles Rennie Mackintosh Society Newsletter, 42, Winter 1985–6, p. 4. 96: J. I. Ballantyne, 'Buildings and interiors update', Charles Rennie Mackintosh Society Newsletter, 49, Summer 1988, p. 2. 97: Peter Trowles, 'Glasgow School of Art', Charles Rennie Mackintosh Society Newsletter, 65, Autumn 1994. 98: Peter Trowles, 'The Mackintosh inheritance', in William Buchanan, ed., Mackintosh's Masterwork: the Glasgow School of Art, 2nd edn, London: A. & C. Black, 2004, p. 170. 99: 'HLF supports the GSA', Charles Rennie Mackintosh Society Newsletter, 91, Winter 2006, p. 25. 100: Richard Waite, 'Overhaul for Mac masterwork', Architects' Journal, 16 March 2006, p. 11. 101: Peter Trowles, 'The Mackintosh Conservation and Access Project: update', Charles Rennie Mackintosh Society Newsletter, 93, Spring 2008, p. 16. 102: Peter Trowles, 'The Glasgow School of Art Mackintosh Conservation and Access Project', Charles Rennie Mackintosh Society Newsletter, 94, Winter 2008, p. 21. 103: Seona Reid, 'Mackintosh Building Centenary', Charles Rennie Mackintosh Society Newsletter, 95, Summer 2009, p. 21.